Let your henna paste dry on your skin for at least one hour, but preferably longer -- up to 8 hours. The longer the paste remains on your skin, the darker your stain will be and the longer it will last. A lemon-sugar mixture dabbed onto the dried paste will help "glue" it to your skin until you are ready to scrub it off. Other methods of retaining the paste include taking an old sock with the toes cut off and wearing it like a "sleeve." Once you remove the paste, your stain will be light orange but will darken over several days before it begins to slowly fade away. If you spend time in chlorinated pools or hot tubs, apply a lip balm or coconut oil to the stain to protect it. 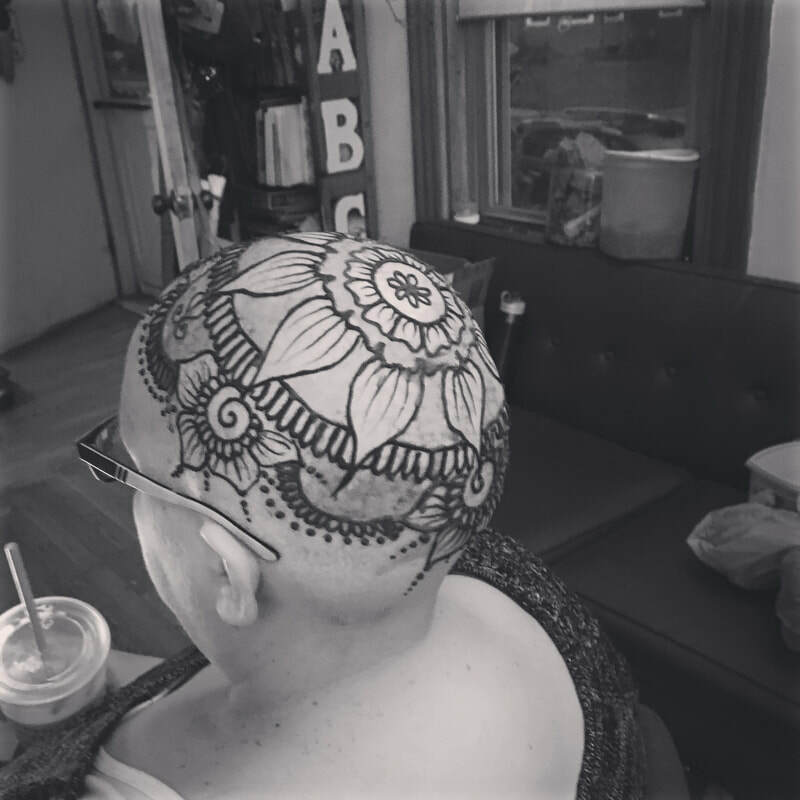 I am going through Chemo and would like to have a Henna Crown. Is this something you do? Not only do I "do" henna crowns, but I love to do Henna Crowns! I offer crowns pro bono as my way of giving back to the community. If you are able/willing to travel, I volunteer for one hour each month at The Healing Garden in Harvard, MA. Feel free to contact me to find out my next day and time! In select cases, I am willing to travel to you! Drop me a line so we can figure out a good time and place. Yes! I make my henna myself, and the ingredients are pure and simple: Henna Powder (the powder is made from the crushed leaf of the henna plant, which is indigenous to countries in the Middle East and North Africa, where the climate is just right), Lemon Juice and Essential Oils. For oils, I use any blend of the following: cajeput, lavender, and clove. I often add peppermint tea or coffee in order to achieve the right consistency. With children and teens with sensory issues and sensitivities, they can interpret the cool feeling of the henna paste as a "burning" feeling, but it is not actually burning their skin. My henna paste is safe for people with all skin types, and is only a true risk (albeit non-life threatening) for someone with a citrus allergy, a sensitivity to caffeine, or to one of the essential oils. Any reaction can typically be remedied by removing the paste and cleaning the skin and/or applying a topical cream.